So this weekend in addition to my normal mutton and chicken breast cooking I decided to try to make one of my favorite dishes Rumaki. I was first introduced to Rumaki in New Orleans at a Chinese food restaurant my first day down there. Later I discovered the most amazing Rumaki at the Chinese Kitchen along with their amazing giant egg rolls. I cant have their egg rolls anymore but I can have Rumaki. Rumaki is pretty Paleo with a few minor substitutions. 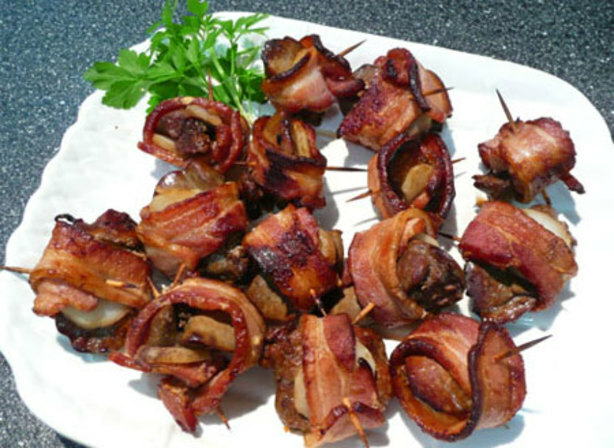 At the heart of it is Chicken Livers wrapped with bacon. Organ meat and Bacon is like the ideal Paleo thing. I think water chestnuts are in there too. You cook the bacon but not too much, Then you soak the Chicken Livers in soy, garlic, pepper, salt. You can sub out the soy sauce for something more Paleo. I cook the chicken livers in some ghee or butter. Once both bacon and chicken livers are cooked I let them sit a little then once cool I wrap the chicken livers with the bacon. I think you put a water chestnut in there too if you have them. I did not. You secure the wrap with a tooth pick, Then you would put it in a broiler but I do not have a broiler here in India so I throw them back in the frying pan.